We are ONE week away from the end of the Whole30 y'all. One week! I just put another huge X on my calendar in red Sharpie and it felt so good. We're in the home stretch and it honestly seems like the whole month of January has just flown by. I'll take it because the last two times I've done the Whole30 the time seemed to go by sooo slow. I don't think it helped that both of those times I had trips planned right afterwards so the countdown for those trips was on as well... I'm not sure that I 'win' this time around though since I don't have a concrete vacation in my future (just throwing myself a pity party over here) to look forward to. This is why I need wine and am anxiously awaiting February 3rd! I'm still pretty much eating the exact same things as the last three weeks though I did try a couple new things. 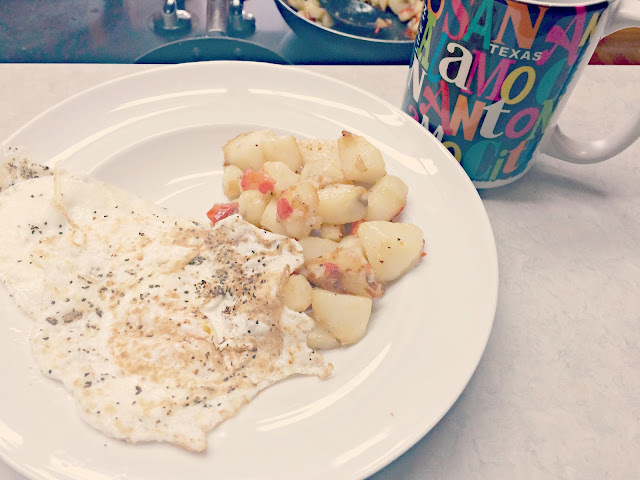 I made these country breakfast potatoes (using ghee instead of butter) and ate them with two fried eggs - they were SO good dipped in the yolk (that's when I really miss toast). I also had some bacon for the first time this Whole30 but since I'm not a huge fan to begin with it wasn't that enjoyable. Fried eggs, bananas, cucumbers with salt and vinegar, and roasted potatoes are still my best friends. I gave myself a break from eating chicken so that I wouldn't hate chicken after the Whole30 and I think the little break I gave myself was good enough and I will probably have some for supper tonight and make a few extra for meals for the rest of the week. I really should have everything written out for what I'll be eating but I've been flying by the seat of my pants and so far its worked so we'll just go with it for the last week. Some of my clothes are already fitting looser (wahooo!) so if that isn't reason enough to do this then I don't know what is! I'm not really craving anything but I do miss being able to eat popcorn or chips while watching a movie or being able to have a glass of wine whenever I want. I also haven't really left my house other than for work for the past 22 days so I haven't really put myself into a situation where I might be tempted. I'm definitely looking forward to getting together with my friends in February though. Being in 'hibernation' mode is no fun! I also think its really helped that I've gotten myself back into a fitness routine while doing the Whole30 so that when its over I can continue with these new habits. I keep telling myself that 2016 is my year so I better make sure to make it happen! You are doing awesome! I am also really looking forward to an adult beverage on Feb. 3rd. I will be hitting my bar on the way home from work with friends! Smart to look ahead to your next whole30, let me know when you pick a date, I want to do another one too! We get in such a rut when we eat healthy. We always eat ground turkey and lately sometimes ground chicken...and zucchini. I personally get SO sick of zucchini (I never ate it before I met Michael) but he always gets more at the store. And I hate making it. Ha. We really need to branch out. February 3rd is SO CLOSE!!! And loose-fitting clothes is such a nice feeling! hahaha good luck finding a new spring time! good job on making it this far again, i'm eating chips right now in your honour lol. WOooooohooooo, the last week. The end is in sight and you are almost there! Way to stick with it and cheers to clothing feeling looser, such a great thing, right? Maybe start April5th. Just one day later. We went to hockey games while on Whole30 and it was tough, but doable. I love your priorities for round 4. Cinco de drinko is important! Haha. You are doing amazing and it's awesome how your clothes are starting to fit different. I still haven't noticed much on that front, but it could be because I can't be active at all. Damn boot. Anyways, keep it up we're almost there!